Regardless of the weather, I usually do not leave home without a bottle of water. 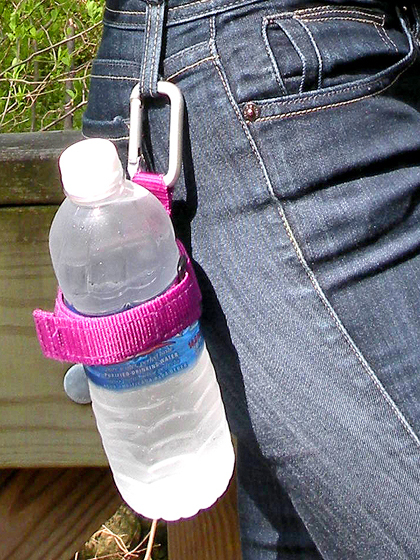 At times, I found it inconvenient to always have to hold a drink so I designed a clip on drink holder that could attach to my belt loop or purse. I created it to be resizable so it wasn’t limited to any one type of bottle or drink. Since I had so many people stop me to ask where I bought it, I decided to have my product manufactured and patented. 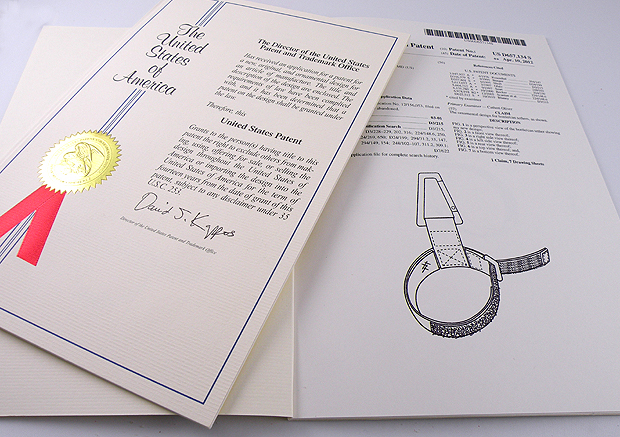 After five long years of working with the U.S. Patent Office, I was finally granted a patent for my creation. I am now selling it on Amazon, local stores and it even at Kings Dominion. It was definitely a great learning experience and regardless of whether it is successful or not, the education and wisdom I have gained from inventing, designing, manufacturing and patenting a product made it all worth it. Here is a link to the Thirst Clencher website. and enjoy being hands-free while still carrying a bottle of water. Here are the four fun colors I had manufactured. 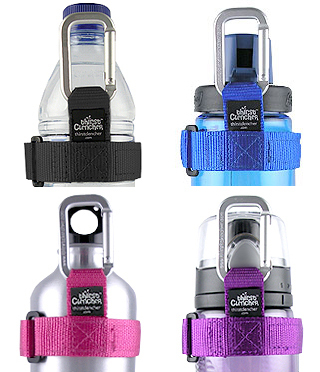 I frequently get emails from people telling me of the all of the interesting ways they use their bottle holder — one person used it to attach a tripod to his backpack, another to hang drinks on a chain link fence in a dugout for a softball team and another used it to attach to the handle of her dog leash so she could walk her dog without holding a drink. It is always fun to hear new uses that hadn’t occurred to me. I just love it because it allows me to go anywhere with my water and still be hands-free. This entry was posted in college graduation, gifts, gina tepper, reuse, reuseable, sewing and tagged belt loop drink holder, canteen holder, drink cup, drink holder, golf bag bottle holder, Hands-free bottle holder, hands-free drink, thirst clencher, water bottle holder. Bookmark the permalink. Wow . . . congratulations! And what an inspiration you are!!! Are these being sold anywhere? I can’t find them…and I absolutely would LOVE to get of them!! Hi Marlene – You can buy them at http://www.thirstclencher.com I can’t live without mine!